The Stitcher's Garden is having a class on how to finish this wooden book box for With Thy Needle and Thread's Berry Days at Thistle Down Farm. If you have wanted to learn to paint, wax, and distress the wooden boxes featured by several designers, this is the class for you. Come ready with your piece stitched and you will leave with a completely finished product. 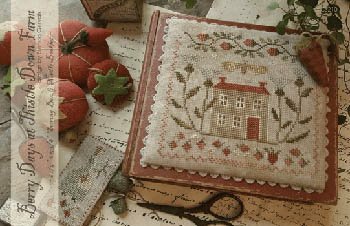 WTNT Berry Days at Thistle Down Farm pattern, 5 WDW threads, 5 GA threads, 1 DMC, rick-rack, wooden book box, and 36ct or 18ct fabric. For more details on listed supplies, call 501-513-1851. Class date is Saturday June 2, 2018, from 10am-5pm. Cost is $25 and limited to only 12.